TMR would like to thank Ginger Taylor for this clever photo! 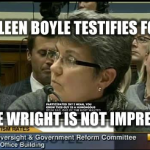 An extra special thank you to Katie Wright for helping us all endure Dr. Boyle’s testimony!! ~Sugah For more blogs by Sugah click here.